This issue occurs if Active Directory Web Services is unable to read the ports that Active Directory Lightweight Directory Services is configured to use for LDAP and Secure LDAP (SSL) services. 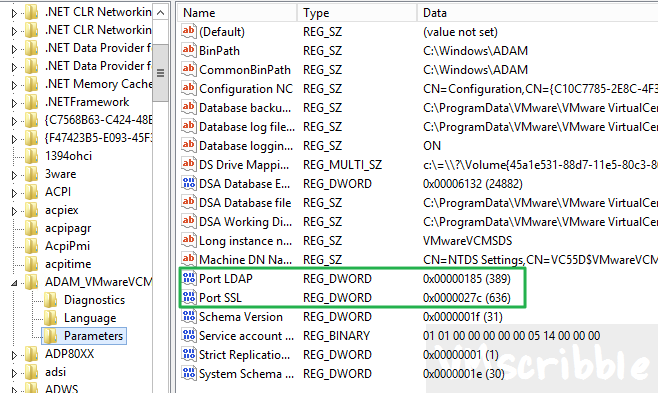 Active Directory Web Services reads two registry entries to check for the configuration settings. Make sure the following two 32 bit DWORD registry entries exist, set to the correct port and NT AUTHORITY\SYSTEM account has permission to read the values. If the value is REG_SZ, you must delete it and create a new REG_DWORD with the value 636 (decimal). HKLM\SYSTEM\CurrentControlSet\Services\NTDS\Parameters\LDAPServerIntegrity is set to 1 (disabled) for Domain Controller LDAP server signing. 1. Restart the ADAM instance (VMwareVMCSDS). 2. Restart the Active Directory Web Services. NOTE – It is best practice is to shutdown all vCenter Server services prior to executing a restart of ADAM as VMwareVMCSDS is a dependent service for vCenter. The Active Directory Web Services warning events still appeared in the windows event logs after rebooting the windows vCenter. WHY? It turns out Active Directory Web Services (ADWS) is not used by vCenter or any vSphere related components. The windows 5.5 vCenter is not a domain controller so using Powershell to execute domain controller related commands does not apply.